My wife Ann and I first met Jane in August, 2013, when we came for a visit with the people of Living Water for a weekend designed to help the congregation look us over and decide exactly what they wanted to do with us. We knew Wayne a bit from his work on the call committee. But Jane was a new acquaintance. She struck me immediately as a person of faith in Jesus, good humor, a quiet commitment to serve others (including needy animals), and a live-your-life-come-what-may attitude. All of those attributes were tried greatly over the last year-and-a-half of her life. Someone has said that adversity has a way of showing who a person really is. Since the onset of her medical issues, who Jane was could be clearly seen. She was exactly who she always seemed to be the first time we met her--a person of faith and good humor, a person committed to service who took life as it came to her--and even more. She was so intent on not having people fuss over her in the period before her death that her passing caught many by surprise. Wayne, David, Anne, and all of you who make up Jane’s family, we know that you grieve the loss of a loved one who was such a vital presence in all of your lives. But we pray that you can take comfort from the same faith and hope that allowed Jane to be the person she was, even at the end of her life. In Jesus Christ, we can all have the same hope and power for living and the power to face dying that we saw in Jane. That’s why the words of Jesus in today’s gospel lesson, John 14:1-6, are perfect. They’re words spoken by Jesus in a moment a bit like this moment. Jesus is in the upper room with the apostles. He’s made it clear that He is about to die and the apostles are shocked and grief-stricken. Jesus had a place prepared for Jane. He has a place prepared for anyone who dares to let go of things like our common human desire to be our own gods, our puny imagination’s inability to fathom the possibility of a power greater than us, or our unwillingness to accept the witness of the church’s first martyrs that this Jesus, seen to have been murdered on a cross, was also seen to have risen from the dead. Jesus has a place in His kingdom for anyone who opens their minds, hearts, and wills to Him and His good news. Jane knew that. Jane lived that. She was one of the people who, by her faith in Christ, let eternity slip into this life, allowing all of us a glimpse of what promises belong to those who believe and how those promises can impact the ways we live, the priorities we adopt, the promises we keep. Jesus has died and risen for needy mortals like you and me. He has prepared a place for all who turn from their sin and receive God’s forgiveness and trust in the gospel message of new life for all who trust in Christ. It’s time now to turn to Jesus and live with God in our lives. 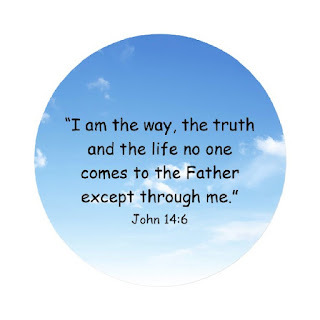 Jesus answered Thomas, “I am the way and the truth and the life. No one comes to the Father except through me.” To be with the God Who made you and loves you and sent His Son to die and to rise for you, the way is Jesus Christ. This is not sweet-by-and-by stuff! We can have life with God right here and now. Jesus promises all who follow Him: “I am with you always.” Even now, as you pass through “through the darkest valley.” The Savior Who could not be contained by death is unlimited in His capacity to give you the strength, peace, and hope of God. King David, writing in Psalm 23, showed that he knew the God ultimately disclosed to all the world in Jesus. That’s why he could say that he feared no evil and that God could comfort him even in darkness. He can bring comfort to you too. The apostle Paul once addressed the disciples of Jesus in the first-century church in Thessalonica. The Thessalonian Christians grieved and worried about the eternal destinies of loved ones who had trusted in Jesus but who had died before Jesus returned to the earth. Would they miss out on the resurrection when Jesus returned to the world? But followers of Jesus also have hope. In Jesus, they know the God Who sustains and encourages the grieving and protects them from despair. In Jesus, they know the God Who understands our pain. And in Jesus, they know the God Who has overcome illness, grief, and death, Who has blazed the trail to an eternity with God filled with joy, life as it was meant to be lived, useful work, and utter love. They know the God Who through Jesus promises that if we will accept the crucifixion of our old sinful selves, sharing in His death, He will share Christ’s resurrection victory over death! Because Jane followed Jesus, she is experiencing the eternity Christ prepared for her even before she was born. And I know that if there is one message she would have me share with you today, it would be this: To be comforted, to live life to the full, to face death without fear or cynicism, follow the Lord that has prepared a place for you. Most days, I try to begin the morning in quiet time with God. You'll see an explanation of how I approach quiet time here. Below is the journal entry for today's quiet time. And when is someone part of God’s kingdom? NOW. The kingdom will come in its fullness, of course, when Jesus returns to the earth, closing down this old creation, and those who have trusted in Him rise to be with Him eternally in His new creation (2 Corinthians 5:17). But the kingdom has already come to us. When we repent and believe in Jesus, we are in the kingdom now. And He says in Luke 17:21, that “...the kingdom of God is in your midst." Listen: How do I live in Your kingdom now, Lord? It’s Jesus’ will for His disciples to live in the world while not being of the world. We are to be cordial and loving toward the world, but when its worship, values, actions, thoughts, and approach to justice conflict with those of God’s kingdom, we’re to stand with Christ. To manifest the kingdom of God today, we must be in but not of the world. But I have several important resources to rely on when it comes to being in but not of the world. But this will only happen, I think, if my reading of God’s Word is begun, filled with, and supported by the very thing that Jesus did in the garden. He prayed. I must pray. Prayer is a conversation in which I connect with God. When I ask God to show me what I need to see in His Word, I find that I see lots more of God and His will for my life than I would if I approached it as a reading assignment. These are two private resources God gives to us to buttress kingdom-living, to foster our own growth as disciples. But God also makes me part of the body of Christ, the indispensable Christian community. We are made for life in the body of Christ (1 Corinthians 12:27). When the kingdom of God comes fully, we will be part of an eternal kingdom that lives out the great commandment, a fellowship in which we love God and love others. Other Christians may annoy us, offend us, even harm us. But we need Christ’s body, the Church. It’s in the body of Christ that we hear God’s Word, not always as we want to hear it, but as read and proclaimed; we receive the sacraments, in which God claims us as His own (Holy Baptism) and which renews us and fills us with Christ’s very life (Holy Communion); we commit ourselves to mutual care and accountability. 1. Express love for my fellow citizens of the kingdom today. 2. Look for opportunities to share Christ with those who seem to live outside of the kingdom. 3. Seek justice for those who are abused or left behind by the world’s system of warped values. 4. Treat others with simple decency. More than seven years ago, I wrote about the sadness with which I'd watched Martin Scorcese's documentary biography of George Harrison. I saw part of it again recently. I'd forgotten this story told by Tom Petty about the day Harrison came to give him unsolicited ukulele lessons and then, opened the trunk of his car. It made me smile. Reuben is a man in the uncomfortable middle. Nine of his brothers are intent on murdering their step-brother Joseph. The nine want to murder Joseph. Reuben wants to rescue Joseph and take him back to their father. But, fearful of his brothers’ rage, sure that he can rescue Joseph later, he suggests that the mob simply throw Joseph into a cistern. Then he, Reuben, would go back, free Joseph, and return the kid to Jacob. Compromise and calm can be good things. Shrewdness can be too. Jesus says that believers are to be “as shrewd as snakes and as innocent as doves” (Matthew 10:16). But when our shrewd acts are rooted in our own analysis and not in the mind and plans of God, they can backfire. “There is a way that appears to be right, but in the end it leads to death” (Proverbs 16:25). Besides, the lie was now being enforced by the conspiracy that had been hatched at Dothan. The mob (the family) had proven ruthless enough to dispose of those who stood in their way; who was to say that they wouldn’t go after Reuben if he showed any inclination to break from the conspiracy? Reuben had reason to feel guilty on multiple counts: (1) for not standing up to his brothers in the first place; (2) for hatching his own plan, relying on his own resources; (3) for not trying to find Joseph after he had been sold into slavery. Listen: Peer pressure can a be a horrible thing, especially when the peers in question are one’s own family members. Families can have a brutal way of pigeonholing and suppressing their members. This happens a lot when there are dysfunctionality and favoritism from parents. These spawn a kind of dog-eat-dog nastiness among siblings that remains into adulthood. I’ve observed this many times, making the story of Joseph and his brothers accessible and believable. The basic problem, of course, is disconnectedness from God. When we remain connected to the God now revealed to everyone in Jesus, in faith buttessed by worship, prayer, receiving Holy Communion, and remaining in fellowship with God's people, the Church, God gives us the capacity to deal with things like family dysfunctionality, fear of the crowd, and our own limited thinking. As we pray to God in Jesus’ name, He supplies the Holy Spirit to give us faith, authentic repentance, guidance, a desire to do what God wills, love for God and for others, and courage. These are all assets that Reuben could have used at Dothan and beyond. Even his fear of death at the hands of his brothers in revenge for his helping Joseph would have been overcome. When we cultivate a close relationship with the God we know in Jesus, we know that death isn’t the worst thing that can happen to us. In fact, there is a kind of living death that Reuben must have endured all of those years. Not all things that people know need to be revealed, of course. The Hebrew midwives were right to conceal the birth of Hebrew boys from the murderous Pharaoh (Exodus 1:19). Corrie ten Boom and her family were right to conceal the Jews they attempted to save from the murderous Nazis. Sometimes, I think, it’s also best to conceal facts that would only hurt, disrupt, or kill relationships. Much of the Oprah-zation of America, our practice of spilling all of our thoughts, feelings, and actions, is predicated on the idea that this is healthy for the one doing the revealing. But how healthy, how helpful, is it for the one to whom sinful thoughts and actions of which they had no knowledge of them are revealed? Jesus says that one day, all of our secret thoughts will be revealed, of course (Luke 8:17). But God’s Word also tells us to speak the truth in love (Ephesians 4:15). Some people speak the truth but without a hint of love, making others miserable. They speak it in order to shock, to elevate themselves, to bring others down. This is weaponizing truth, a bit like what the serpent did in the garden when he told Eve that if they ate the fruit from the forbidden tree, they wouldn't die. That was a true statement, in a way: Eve and Adam didn't die immediately after eating the fruit. But what the serpent concealed with his artful truth-telling was that because they ate the fruit, Adam and Eve would die, just not right away. We should always, I think, prayerfully examine our motives before speaking truth to someone else. God, in fact, may sometimes call us to keep our traps shut and keep the misery to ourselves rather than unnecessarily spreading it to others. But since Reuben was complicit in so many ways with what happened to Joseph and he failed to do the right thing because he relied on himself rather than on God, it’s hard not to see him as a morally compromised person. The question that remains, of course: Is God showing me some of myself in Reuben? Is there something in Reuben story indicating that God wants me to see or change my own behaviors? I have to say yes. Like Reuben, I’m prone to stand down when I should stand up. Like Reuben, I can be fearful of what others might say or think of me rather than heeding God’s will. Like Reuben, I often busy myself with my own plans when I should be consulting with God regarding His plans for me. Respond: Help me, Lord, in a tangible way, to stand with You today. And help me today to make plans in consultation with you and not with my own heart, mind, or preferences. In Jesus’ name I pray.